Lukiškės, which today is part of the city centre of Vilnius, for a long time was one of the oldest suburbs of the city, or to be more precise, a settlement near the city. It is a territory with one of the most unclearly defined territories in the city that has caused a number of conflicts and problems, which was fated to sooner or later become a part of the city due to its location. The origins of the name "Lukiškės" and the history of the territory up until the 15th century is unclear, and is shrouded in legend. Historian Jonas Jurkštas has put forward a hypothesis that it would mean a place near the river – a place for fishing or meadows (lankos) near a river may have been called "lukiškės" in Lithuanian. The name "Lukiškės" in historical and cartographical sources up until the 19th century was identified with a broad territory that today is limited to the area of the River Neris from Mindaugo Bridge to Lazdynų Bridge, and from there along Savanorių Avenue, J. Basanavičiaus Street, K. Kalinausko Street, Liejyklos Street and T. Vrublevskio Street until the river. Roads led through there toward Vilnius from the west and southwest. The first mention of Lukiškės in sources is in 1441 with the privilege of Lithuanian Grand Duke Casimir Jagiellończyk to the city of Vilnius, in which it is written that "We give our field for all time: from one side from the city itself to the River Neris, and from the other side from Pamėnkalnis to Lukiškės." From the text of this privilege, it is not clear what Lukiškės is – is it a village or simply some sort of settlement? And what territory does it occupy? From the points referred to in the 1441 privilege – Pamėnkalnis, which stretches to Vingio Park (in the source called Czartowa góra or Devil's Hill; Jurkštas has pointed out that in sources from the beginning of the 17th century, the Lithuanian place name is mentioned ("pamėnas" meaning ghost) which today is incorrectly called Taurakalnis (or to be more precise, the right part of it going up along Kudirkos Street.). The part of Pamėnkalnis from the former Profsąjunga House to the Petras Cvirka monument called Moliakalnis, or Clay Hill (marked as Góra Gliniana in sources from the middle of the 17th century, and as Molekalnis in sources written in Lithuanian at the time), was used as a clay quarry. Pamėnkalnis was valued for centuries as a spot to get an overview of the city. In 1688 Jan Sobieski, the ruler of the Poland and Lithuania, took in a beautiful view of the city from the hill. Lukiškės, mentioned for the first time in the middle of the 15th century, remained an abstract territory along the River Neris to the west of Vilnius until the end 16th century. At the end of this period, plots of land started to be given out to nobles. It is possible to see small houses scattered about in a chaotic manner in the lower left side of the inaccurately drawn background of Vilnius of a map made by Georg Braun from the middle of the 16th century, as well as in a panorama of the city drawn by Tomasz Makowski from around 1600. In 1642 next to the beggar cemetery, Jurgis Liutauras Chreptavičius (Jan Litawor Chreptowicz) funded the Lukiškės Dominican monastery and built the wooden Church of St. Philip and St. Jacob the Apostles. In 1655 when the Muscovites took over the city, they burned it, and was rebuilt after 9 years together with the monastery, however it burned once again, thus in 1690 they once again began rebuilding it, and in 1727 finished, with a new brick church in its place (the monastery was finished in 1731), which still stands there today. The church took on its current appearance around 1797, and became the most important architectural accent of Lukiškių Square. It is possible to see in two Lukiškės maps of unknown authors from 1646 and Friedrich Getkant's map of Lukiškės from 1648 that it was only the northern part of the territory surrounding the square that was inhabited, i.e. near the river behind the church and in what was called Tatar Lukiškės. Of the roads that are marked, only one can be identified: there is a segment of a street between the square and church as well as its continuation further on down, and that road is Lukiškių Street. In a map of Vilnius done by G. M. Furstenhof from around 1730 and a map of Lukiškės drawn by Laurynas Gucevičius in 1790, it is possible to see that there is more inhabited territory in Lukiškės behind the church and near the river, while the territory of the square is framed and crossed over by similar roads and paths that are marked in maps of the middle of the 17th century. It was only in the second half of the 18th century that Lukiškės regained its importance it had for the city in the middle of the 17th century, and began to expand quickly as the suburb came into contact with the city. Most author from the 16th century up until today, according to tradition, claim that the Tatars were settled in Lukiškės by Vytautas at the beginning of the 15th century, but there are solid arguments that the Tatars received permission to settle in Lukiškės from Sigismund Augustus only in 1568. In the 16th century, a pier was built for river ships behind the Tatar settlement. A market appeared nearby. 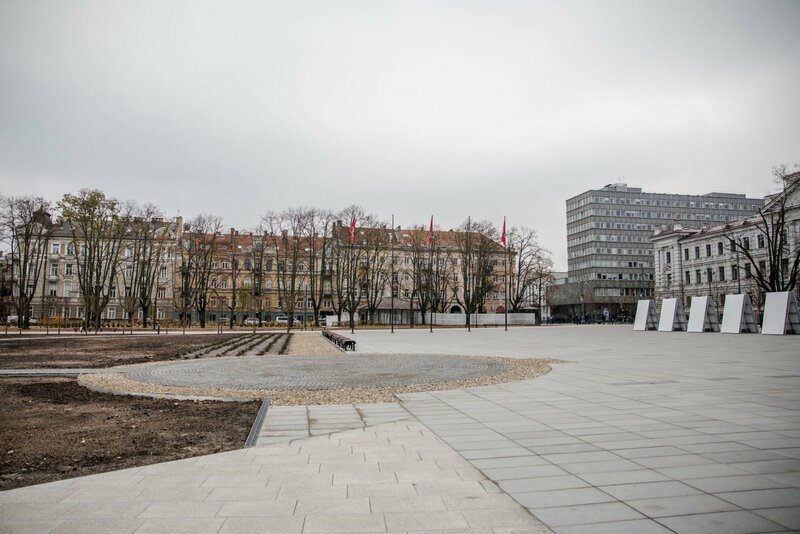 While the first half of the 16th century saw the eastern part of the historical Lukiškės expand and become a suburb of Vilnius called Puškornia, the second half of the 16th century saw it grow to the west beyond what is today Vilniaus Street until Vingio Park, i.e. a suburb that today is called Lukiškės. During the 17th and 18th century, Tatar Lukiškės was comprised of about 30 houses almost the entire period. Each of these houses were inhabited by several families living in poverty. There was also a small mosque there with a small cemetery near it. Some Tatars earned their living as carters, others by dealing in retail trade, and still others by bleaching laundry on the shores of the Neris. The 17th century was a complicated time for Lukiškės as well as for the entire city. In the first half of the century, this suburb, like the entire capital, grew quickly, because of the growth of storage places and its significance as a port. If not for the catastrophe of the middle of the 17th century, at least the part of the suburb under the control of the city most likely would have been urbanized at the end of the century. However the occupation of Vilnius that started in 1655 not only ruined the city, but also Lukiškės, which once again was burned at the end of the occupation in 1660. In August an September of 1655, Tsar Aleksey Mikhailovich stayed in a large tent set up in Lukiškės, as he did not want to live in a city that had been devastated during the occupation. Most likely a camp had already been established there at that time, where later on during the entire time of the occupation Muscovite units marching through would stay. They would break apart the houses of the inhabitants of Lukiškės for firewood or defensive fortifications for the camp. For the next 40 years, the meaning of this suburb grew once again due to its storage places and port, but its doubtful that it achieved the level of the middle of the 17th century due to the overall decline of the city and state as well as the damage they suffered. It was the port and the storage places near it that connected this suburb with the city the most. The Northern War that started at the beginning of the 18th century once again stopped the development of Vilnius (as that of Lukiškės), because the city was ravaged by Russian, Swedish, Saxon and the Commonwealth's army units. Lukiškės suffered during the plundering of Vilnius by the Russian army in 1734, because a number of nomadic Bashkirs and Kalmuk units stayed in the mosque and the area surrounding it. The area around Lukiškės (especially the church and monastery) were affected by the events of 1792-1794, because Russian artillery were shooting at Vilnius at the beginning and end of the Kościuszko Uprising from Pamėnkalnis. V. Jogėla, E. Meilus, V. Pugačiauskas, Lukiškės: nuo priemiesčio iki centro, Vilnius, 2006.